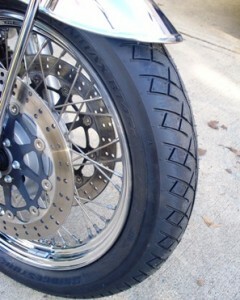 My Guzzi’s handling has improved tremendously since switching to Bridgestone Battlax BT45 tires. With 11,000 miles on my California Vintage odometer, I had noticed an intermittent steering wobble occurring mostly during deceleration and acceleration. In the past, this occurred much less often. It was usually a result of my my front tire pressure being a few psi low. I’d normally top it off and then things would improve. Lately, that remedy no longer worked. My front and rear tire pressures were good. 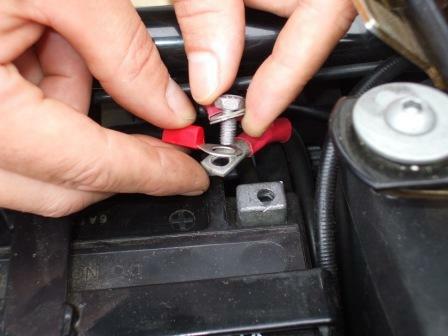 I thought about tightening up the steering damper, but I could not understand why this nagging wobble was happening so often now on my Guzzi. My registration was up for renewing, which meant I had to take it in for the annual inspection. Since my tires were fairly worn, I decided to have a new set installed. I’d finally replace my original Metzeler Lasertec tires since tread was very thin along the centers. I had been trying hard to squeeze more miles out of these and delay the cost of a new set. As it turns out, my delaying new tires was penny wise, but pound foolish. My problem was that I didn’t realize what a big impact the tires were having. Here, I want to share my findings to my fellow Guzzi fans to help you to avoid doing what I did. Why was I a fool? As motorcyclists, we often pride ourselves in being “in tune” with, or being “one” with, our bikes. Being able to spot trouble before it happens is one element of safe riding. 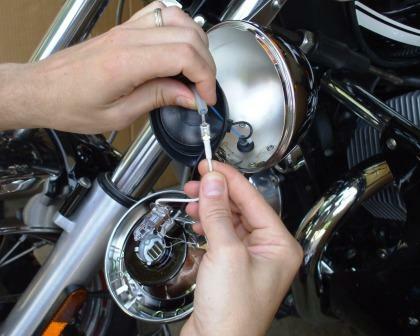 We often like to diagnose problems and fix or adjust things to remedy them so that we can ride trouble free. To my embarrassment, I was riding an ill-handling motorcycle (increasing annoying steering wobble during deceleration and acceleration). My bike had also developed a mind of it’s own (steering following every minor deviation in the road surface). It no longer had the smooth comfortable feel (as if the front suspension was misadjusted and I just could not find good settings on the dials anymore). The really embarrassing part is that I didn’t even realize how bad things really had become. I only realized this after riding on my new Bridgestone Battlax BT45 tires for the first few times. My Moto Guzzi California now rides and handles so excellent that I can hardly believe it! It is like better than new, no joke. I am dumbfounded that I was so foolish in delaying the new tires. This is a perfect example of how things can degrade so slowly over time that we barely can perceive the change. My bike’s quality of ride had degraded sharply over the years and I was barely aware. I was wrongly blaming some of the symptoms on tire pressure, suspension adjustments and the steering damper. Here in North Carolina, the state requires annual safety inspections for motorcycles. This has to be done before you can renew your annual license plate registration. I’ve always had my Moto Guzzi inspected at Motorcycles of Charlotte because the Moto Guzzi dealer where I bought mine from was unfortunately not a state approved inspection station. Motorcycles of Charlotte is a dealer for BMW, Ducati, MV Agusta and Triumph motorcycles, and an excellent one at that. Their new 2 story facility, located at Westinghouse Boulevard and I-485 in Charlotte, NC is truly state-of-the-art. It is more of a destination than just a dealership really. If you are ever in the Charlotte area, you really should stop by and check it out, especially on a Saturday around lunch time for a hot dog or hamburger. It was because of my taking it to Motorcycles of Charlotte for inspections over the years that I began to like and trust them more. They treat me well and are very professional with everything they do. Having them change my tires for me was an easy decision. When I brought it in, a few of the guys there told me mine was the second Guzzi in for service that week. Their waiting area (clubhouse/movie theater/kitchen, etc.) makes waiting easy and relaxing. The state inspection went well as expected. My new tail light caused no problems. 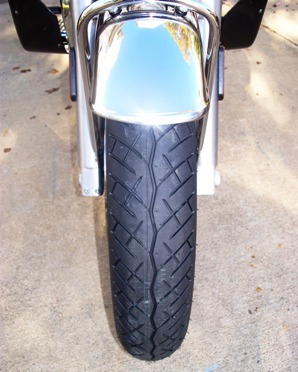 With my new Bridgestone Battlax BT45 tires installed, I rode very carefully home. I was amazed how awesome the bike handled and rode. The ride was smooth, smooth as glass and effortless to direct. No hint of wobbles anymore not matter what I did. It was extremely well behaved and pure joy to ride again! What a relief. I was shocked how much better it felt. Of course, any new tire would probably feel great in comparison to my old ones, but this improvement was huge! I really did not expect that my old Lasertecs were worn and aged that poorly to cause my Guzzi California to develop such bad manners. Anyway, why did I choose Bridgestone Battlax BT45 tires instead of Metzeler Lasertec tires? I wanted a good sport touring tire at a reasonable cost and with recommendations from others that have had tried them. Both the Lasertec and the BT45 had decent recommendations, but I always felt that maybe the straight center groove on the Lasertec front tire was causing some pulling or grabbing when I was on a crack or some other small defect in the road surface. I preferred the BT45 because the center groove of the front tire (and rear tire) is a zig-zag shape, not straight. Maybe this will help. I had researched what other riders had experienced in several forums such as WildGuzzi and Advrider, just to name a few. I also met with a Michelin factory rep to learn about their motorcycle tires at an open house I attended at a dealer recently. I read many reviews for the Bridgestone Battlax BT45, and considering their reasonable cost, good reputation, availability, they were near the top of my list. The tread pattern is one that I like too, so that why I decided to give the BT45’s a try. WOW! I never expected such a huge improvement to the ride and feel of my California Vintage that these new tires has provided. It honestly feels better than new! Well “new” was in 2008 for my last tires, just to be fair, my memory of “new” is probably a little skewed by now and my Lasertecs were wearing pretty thin. I have to say that with my all new riding experience on my new Bridgestone Battlax BT45 tires, I’m feeling a bit like a fool because I waited so long to have this done. I can clearly see now that my being extra frugal and squeezing an extra several hundred, or maybe a thousand miles out the old tires was simply not worth it! October 2017 update: Just had my Guzzi’s annual inspection done at around 20,500 miles. Tires are still good with about 9,500 miles on them, but they will likely need replacement before next year’s inspection. I’m still very pleased with these BT45 tires and plan on getting them again. 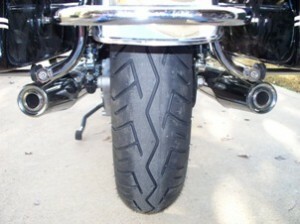 Hi Steve, I checked bridgestone.com and they list your tire size for Battlax BT-45V. Yes, they are tubeless tires, as are mine, and tubes can be used with them. I have read that running tubes reduces the actual speed rating of the tires. I don’t race and I don’t ride anywhere near the speed rating of these tires anyway. 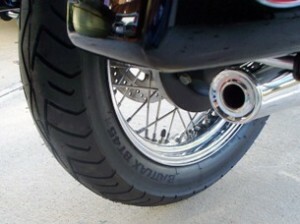 They have been great on my California Vintage’s stock Route Borrani wire wheels and I will definitely buy them again. I’ve been very happy with them. Hi John- I may be missing something here, but since you and others have sold me on the BT45’s, and I need a new front tire, I am still not understanding their use with spoke wheels (which I have) which require a tube. 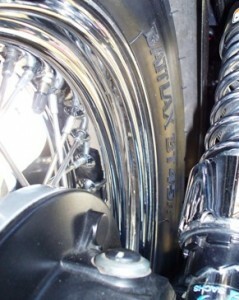 As I understand it tube tires are designated by having “TT” after the sixe and speed rating . My California 1100 owners manual says I should use a 110/90-18 size. I don’t see BT 45’s listed with the”TT” designation for sale at the usual places. Can I use a non-TT tire with a tube? If not, where can I buy the BT45’s for use with tubes? Thanks for your good works keeping up the site. I just bought a 2000 California Special this month (Oct 2) on Bridgestone Battlax. It was weaving and following ruts. I slackened the steering damper off to the lowest friction level and it seems fine. I wonder whether these tyres had vulcanised (the outer surface hardened) while both previous owners have done pitifully low miles and the por bike sit ting idle for months or years. Wore out the originals at about 8000 miles & put on Avon Road Riders. Not recommended. They don’t handle well until they have warmed up for about 50+ miles, lot’s of wobble cold and there is still some when hot. I have to run them at 35 to 36 PSI front & rear or the wobble gets real nasty. ( I weigh in at 130lbs). I’m hoping I can wear these out in a hurry and try the BT45’s. Phil, my California Vintage, and I believe all Cal Vins, came with Route Boranni Milano rims from the Guzzi factory and with Metzeler Lasertec tube/tubeless tires using inner tubes due to the wire spokes. my calif vintage came with borrani tubeless rims from the factory. what brand rims do you have and are they tube or tubeless? One thing I think you did not mention is that for motorcycles designed during the pre-radial motorcycle tire era (like the MG California and the Kawasaki EX), it;s recommended that you stick with bias-ply tires. The BT45 and ME880 are bias-ply tires. As for MG dealers near you, Moto Nexus is a good shop. My favorite, though, is Rider’s Hill (European Motorsports, Inc.), in Dahlonega, GA. Okay, so it’s about twice the distance for you, but the ride is nicer, and it makes for a great destination. Plus, they have Guzzi Steve. People come all the way from Miami, FL (me), Kentucky, even Chicago, to have him work on their Moto Guzzis. I’ve just discovered your blog wich is a real reading pleasure. 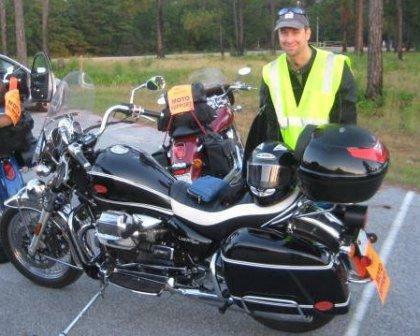 I’m about to buy a 2010 cali vintage after 2 years of HD electra-glide standard owning. My previous bike was a real pleasure to look at but a little bit desappointing to ride. brakes, sound (on originals mufflers) even torque werent as good as I expected. On the other hand I couldn’t stop enjoying the audio system wich is a really great thing to have on a bike when you’re a music fan. Anyway after selling it I though of my first REAL bike, my V11 LE MANS (my first bike was a K75 BMW). I remembered the smile on my face on those smooth and twisty roads the day i went back home after purchasing it. 120 miles of pure fun and pleasure. I also remembered the two runs around como lake riding the new STELVIO (I had to get it back before 4pm because they had a big party for its launch in the evening) and a few days later a cali classic rented from famous mandello concessionary AGOSTINI. I still have vivid memories from these rides. Anyway I had to get back to guzzi owning. With the help of the WEB just found me that 6000 miles as new black vintage that will turn in my ownership within the end of the month. And just to get back to your topic its tires are new. Hi Steve, it seems the dealer that you got your California from was correct. I had not heard that about the Lasertec tyres (for you) before, but it was certainly true for my bike, and to the point of being dangerous. I had no idea the tires were causing all of the bad handling problems. As far as these new Bridgestone BT45’s are concerned, I am extremely pleased so far.